Posted December 6, 2017 by Staff Writer & filed under City Hub. It could be a case of going back to the future for the newly-merged Inner West Council if a coalition of independents and Greens get their way for a demerger from their 2016 forced amalgamation. “Communities a lot less affluent than our council have challenged the mergers and they have won,” Councillor John Stamolis, Independent, Balmain Ward, said. Cr Stamolis estimates that around 50 per cent of Inner West councillors support the demerger plan that they are hoping will go to a vote on December 12th, when council meets next. The call for the Inner West Council to demerge has been on Cr Stamolis’ agenda since 2016 when he publicly questioned the forced merger plans. In fact, Inner West was the only council forcibly amalgamated out of the 12 other Sydney inner-region councils, representing one million people. The others refused to merge. 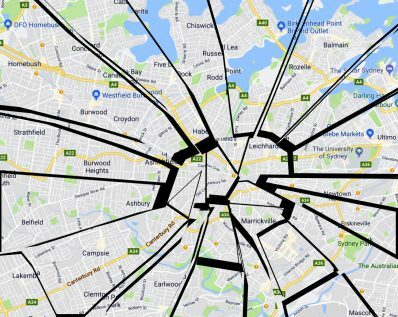 “It was basically the three Labor mayors of Ashfield, Marrickville and Leichhardt that got us into this and it is time for them to lead us out of this,” Cr Stamolis said. He pointed out that the population of the Inner West Council is 182,000, three times the average of all other 12 councils in the inner region. “In my short time on the council I have seen very few tangible benefits delivered to the community,” said Cr Lockie, “and what are delivered, are at a huge cost that the community is not aware of,” Lockie said. Councillors Lockie and Stamolis were speaking after an address given by Labor shadow-minister for local government, Peter Primrose, where they heard him say that, if elected, NSW Labor’s policy was that they would support councils going through voluntary demergers. “There is a potential that if Labor win the next election, demergers will be legally possible,” Cr Lockie said. Cr Stamolis claims that access to Inner West councillors is at an all time low, with just one representative for over 12,000 residents, compared to an average of one councillor for around 6,000 residents across the 12 un-merged inner region councils. Cr Lockie said that the demerger campaign owed a lot to the efforts of Rochelle Porteus, Greens councillor for Balmain Ward. Cr Lockie claims that the $10 million grant from State Government to fund the merger process is inadequate, as new estimates from council staff now place that cost in the order of $45 million. The Inner West councillors are not alone in wanting to demerger from a forced amalgamation, with Greens MP David Shoebridge on the record as saying that he would support the 20 new councils in achieving demergers. Other support for demerging has come from state Nationals leader John Barilaro, who has been critical of the forced local government mergers in the bush. “Not challenging the merger was the biggest political miscalculation in the history of the inner west,” Cr Stamolis said.